Released: ESIC 2019 notification was released on 21st December 2018 . Vacancies: There is a total of 1125 vacancies available for ESIC 2019. 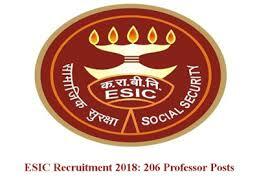 Job Posts: This exam is conducted by ESIC for various posts such as Clerk, MTS, UDC, Stenographer, Paramedical Posts through ESIC Recruitment 2019 Exam. Reservations are also being provided for SC/ST and OBC candidates.